Beauty pageants, nowadays, are said to be losing their grip in Japan. Although culturally and historically speaking, the Japanese have this unique way of celebrating and appreciating beauty – of course, being the first Asian country to win the Miss Universe crown – Japanese people are more drawn to the cuteness of AKB48 than the sophistication and glamour of a beauty queen. Miss Earth Japan is changing that wrong concept about pageants, and is inspired to be a catalyst for change in modern times. Now on its third year of holding a national pageant, the franchise has been showing consistent success in the international competition called Miss Earth (based in Manila). Tomoko Maeda was a Top 16 finalist and Best National Costume winner in 2011. This was followed, again, by Megumi Noda’s Top 16 placement in 2012. However, during Miss Earth 2010, Marina Kishira was only an appointed delegate from Japan, yet she successfully landed in the Top 7 and bagged the Best National Costume award in Vietnam. Last June 15th, 16 beautiful and determined young earth warriors gathered in Iino Hall, in Tokyo, in quest for the top title of Miss Earth Japan 2013. They all competed in the opening dance category and swimsuit before the delegates were trimmed down to a Top 8, where they all battled it out with a prepared speech and the Q&A portion. What was rather interesting during the pageant night was the talk and slide show of the outgoing queen, Megumi Noda, and the 2011 winner Tomoko Maeda, as they both shared the activities and projects of the Miss Earth Japan organization for the year. During the talk, the two queens were caught laughing at themselves because in most photos, Megumi was just wearing t-shirt and jeans – proof that being a Miss Earth is more about working for the environment, and not about looking fabulous or glamorous. Megumi shared her photos during the competition in Manila, and emphasized how that experience had opened her eyes to the various environmental problems of other countries. After Megumi the international competition, she came back to Japan and it’s all work again for her as she collaborated with Tomoko and other Miss Earth Japan warriors in conducting various environmental awareness activities such as cleaning up of the Shonan area, a popular beach getaway, south of Tokyo. Megumi also went to a tsunami-devastated village in Miyagi Prefecture, where she helped in the restoration activities in the area. After the talk, all the delegates came back to the stage wearing their evening gowns. There was no more judging of the girls wearing their elegant dresses as they immediately announced the Top 8 finalists. The Top 8 finalists delivered their respective prepared speeches, and then, they were asked one pageant questions by the judges. 12. Honami Kuroda (23, Kumamoto) stressed out that she was just enjoying every moment, and did not want to be pressured by thinking about the result. She was asked what could make her smile, and she replied that she smiles when she sees people around her smiling, especially those who have been supporting her all throughout. 7. 25-year-old Megumu Sebata of Osaka was very serious with her platform for the environment. In response to her question, she believes that happiness is through meeting various people and being able to learn from them. 14. Short-haired Mikari Okutsu (24, Kanagawa) explained that fashion is her passion, so she believes that through fashion she can accomplish her job as Miss Earth Japan. 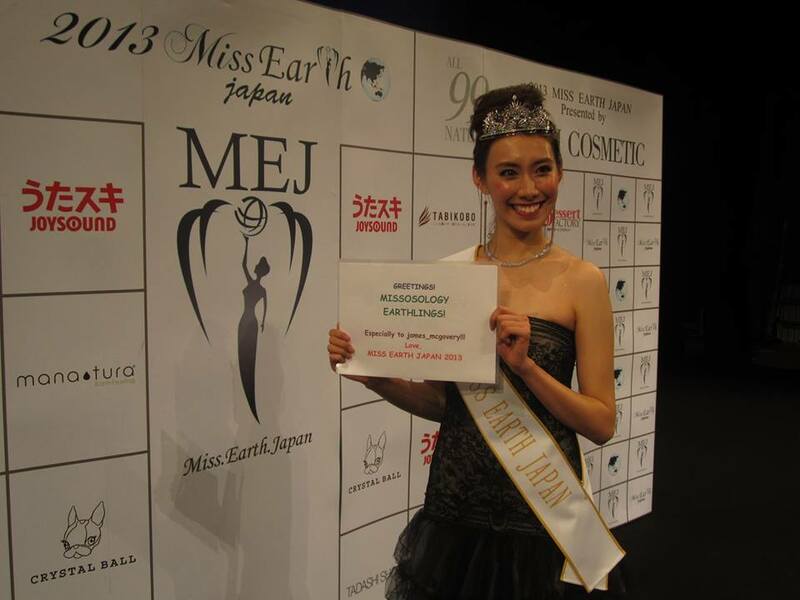 She was asked to evaluate herself and if she had what it takes to be the next Miss Earth Japan, and she said that believing and having confidence in one’s self are the primary keys to succeed in the job of becoming an MEJ winner. 9. The youngest candidate, 18-year-old Rika Kawai of Osaka said that she just wanted to show her real self during the entire night. In her final question, she got really emotional, to the point of crying, when she shared that ever since she was a kid, her mom taught her the value and meaning of love. 13. Ehime native Akuri Besyo (25) and one of the tallest candidate at 172 cm, said that she is a beach lover and really enjoyed being in the water when was a kid. Asked if she was given any magical power, what would it be, she replied that being from Ehime and now working in Tokyo, she would love to have the power to be able to automatically transport from one place to another so that she could easily spend more time with her family. 16. Yu Horikawa (24, Tokyo) stressed the importance of environmental awareness program in her speech… Asked the dreaded pageant question about her “biggest regret in life”, Yu was caught not being able to come up with a solid response, but later on stressed out that she regret being too self-centered in the past, and even during the past few days leading to the competition. It seems that right there, she already felt that she was not going to win anymore, as she kept on saying “I’m sorry” in her answer. 1. 24-year-old graduate student Mai Yamada of Okayama studies genetics as in a graduate school. She wanted to use her knowledge on genetic engineering, to be able to help solve some medical problems in the world. Asked to define beauty in her own words, she shared about Ashley – a little girl who just died because of genetic deformation – and how it really affected her so much. So, for her, beauty is about living your life, no matter how long or short it is. 11. Yoshimi Maeda (22, Osaka) was asked about the advantage of women over men, and she said that being beautiful and glamorous are the things where women can excel over men. Overall, the speech and the Q&A portion gave us an impression of the candidate’s intelligence and overall personality. The candidness of Yu Horikawa to the intelligence of Mai Yamada, there was variation among the different answers of the Top 8 finalists. The night ended with Yu Horikawa being proclaimed as Miss Earth Japan 2013, with her runners-up Honami Kuroda (Miss Air Japan), Mai Yamada (Miss Water Japan) and Akuri Besyo (Miss Fire Japan). Together for a year, they will work for the various environmental causes of the Miss Earth Japan organization, while at the same time, Yu prepares for the international pageant in a yet to be disclosed location. During the press presentation, Yu Horikawa promised that by having the title, she will do everything that she can in order to be of service to others, something that she felt was lacking in her 24 years of existence. Armed with an amazing smile, she says that it is her ultimate weapon to win over the judges in the international competition. Although it was very obvious that she could not believe that actually won, she remained composed, candid and very true to herself. Next articleBeauty Talks with Reilly Mboumba: Will She be Africa’s First Miss International?